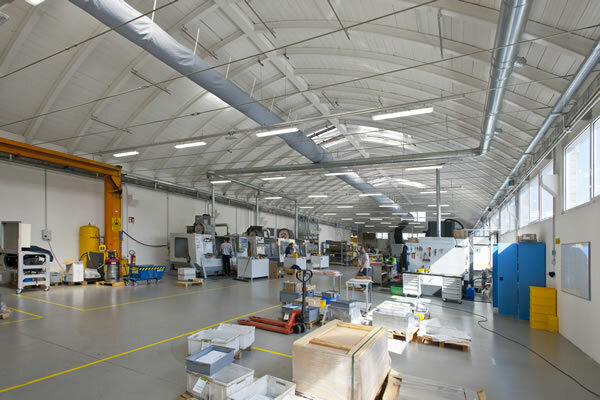 COOLTECH headquarter and manufacturing facility is based in Formigine, Italy, 45 minutes by road from Bologna Airport and 2 hours from Milano Linate Airport. Formigine is a part of an highly industrialized area well known as “Motor Valley”, where state of the art mechanical engineer is well represented by world known brands like Ferrari, Maserati, Lamborghini, Pagani. Our new 2700 sqm facility hosts all the operations of the company, from machining to assembly departments, including R&D activities and general administration. The Components Business Unit develops and produces liquid cold plates and radiators. Our machining department is equipped with CNC machining centers, Vacuum Furnace, Helium leaktest system and a metallurgical laboratory for metal analysis, including also a 3D CMM machine. The Cooling Unit Business Unit develops and produces air to liquid, liquid to liquid, compressor based cooling units for high tech applications. This department is equipped with qualification test laboratories for functional and environmental qualification tests. More than 1200 sqm are dedicated to assembly areas for a total of 3 different production lines.